Two epochal forces are shaping this century. One is economic, the $6 trillion dollar investment that will be made in developing fossil fuel assets over the next decade. The other is physical, the immutable behaviour of carbon atoms in the atmosphere. These forces are currently on course for a head-on collision. If this occurs, the consequences will transform the life of every one of the planet's eight billion people. If we avoid the collision, life for everyone on the planet will also be transformed but most of the value of those fossil fuel assets will be destroyed. The fossil fuel investment is being driven by the need to maintain energy security for an ever more affluent and urbanised global population. By the middle of this century there will be over eight billion of us, of whom six billion will be living in cities. By then perhaps half of us will be affluent enough to own cars and homes full of energy using goods. Current forecasts project a doubling of global energy demand, three quarters of which will be provided by oil, gas and coal. There will be little tolerance for governments that fail to maintain secure access to affordable energy. The physics is being driven by our consumption of fossil fuels. As we burn them we add carbon in the form of carbon dioxide to the atmosphere. 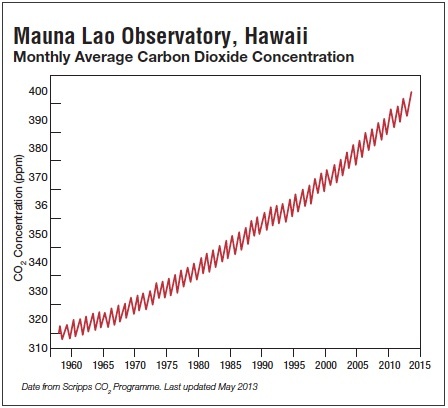 This year, the concentration of carbon dioxide measured at the Mauna Loa Observatory in Hawaii touched 400 parts per million (ppm) - 120ppm higher than the pre-industrial level. This concentration has increased every year for the last fifty years and the rate of increase is now higher than ever. As things stand, the International Energy Agency (IEA) estimates that the world is headed for a 'long-term average temperature increase ….between 3.6°C and 5.3  °C'. This is considerably higher than the 2°C that governments have already agreed is the threshold of dangerous climate change. The political consequences of failing to maintain climate security will be less immediate than those from a failure of energy security but they will be far more significant. Recovery from a loss of energy security is possible if not always easy. There is no recovery from a loss of climate security. Were we to cease adding carbon to the atmosphere today it would be a millennium or more before concentrations returned to pre-industrial levels. The world has just had a brutal lesson in the consequences of failing to deal with systemic risks. Such risks arise from the interdependencies between the elements of a system such that a failure of a single element can lead to a cascade of failures that brings down the whole system. Such were the interdependencies in the global financial system that the failure of one bank threatened to bring down the whole global economy. The central role of the financial system in underpinning the global economy is widely recognised. Without huge flows of private and public capital it cannot function. It was the threat to these flows of capital that made the financial crisis so urgent and action to tackle it so rapid. It is less well understood that those flows of capital also depend on political stability. Without the confidence that comes with political stability, investors will not invest. Without investment, there is no economic growth. Lack of growth in an expanding population with rising aspirations threatens to further undermine political stability. It is barely grasped at all that a stable climate is a prerequisite for political stability. Food, energy and water security are the pillars of prosperity. They support the political stability on which economic success depends. Our changing climate is already making the maintenance of the pillars' integrity more difficult in some parts of the world. As the change accelerates it will make this task progressively more difficult everywhere. Eventually it will become impossible. Governments thus face a nexus of strategic risks they are ill equipped to handle. The dynamic nature of politics in our hyper-connected world makes holding a steady course over many years difficult in the absence of a widely accepted sense of imminent danger. For the listed companies for whom the $6 trillion dollar investment in fossil fuels is the future, this presents a baffling paradox. Extractive industry investments are very capital intensive. Their scale is such that projects typically have a life of forty years or more. If governments grasp the climate nettle and take decisive action then the world will make a rapid transition to a low carbon economy. 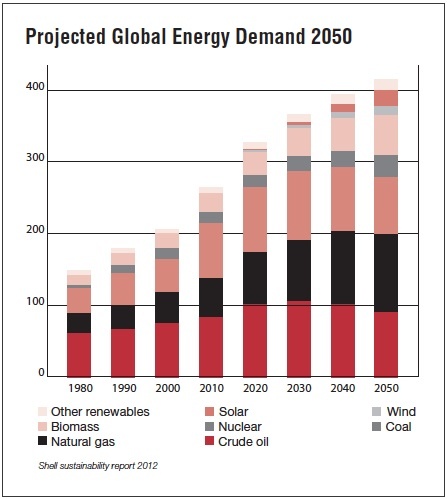 In which case there will be no need for fossil fuel investment on anything close to this scale. If, however, governments fail to grasp the climate nettle then the world will pass the threshold of dangerous climate change well before the middle of the century and there will be little investor appetite for risky, long-life, high capital fossil fuel projects. This paradox places the fossil fuels companies in a quandary. If they invest and governments decide to act decisively then they will not realise the full value of their investment. Shareholders will be cross. If they do not invest and governments fail to act decisively, their shareholders will be cross immediately but the loss of value will come later, destroyed by climate induced political instability. Pricing such political risk is at best an arcane art little practised in corporate boardrooms. Quandaries of this nature rarely stimulate innovative behaviour in companies. More likely is a firm commitment to business as usual well wrapped up in a thick blanket of corporate responsibility-speak. Compounding this quandary is the rapidly falling cost of wind and solar power. This is particularly acute for the international oil companies. Increasingly shut out of access to new oil reserves by the nationally owned companies, they have shifted their resource base dramatically into gas. Shell's famous Pecten logo now brands more gas than oil. Gas, whether from conventional or unconventional sources, is abundant – leading the IEA to talk of a 'Golden Age of Gas' and the oil/gas companies to promote it aggressively as a lower carbon alternative to coal for the electricity generation. The cost of solar and wind generated electricity has continued to fall far faster than most analysts have predicted. The massive Chinese commitment to deploy renewables has played a significant part in confounding such predictions but it has been supported by policy initiatives elsewhere in the world, particularly the EU commitment to meeting 20% of its primary energy demand from renewables by 2020. The result is that wind and solar are approaching grid parity, that is able to compete with fossil fuels without subsidy, in many parts of the world. This led a recent report from UBS to talk about an 'unsubsidised power revolution'. This is a prospect that was previously unthinkable for the electricity generation. In 2012, renewable power in Germany took a 22% share of consumption. This sparked an 11% fall in natural gas fuelled electricity and a steep fall in the share price of German utilities RWE and EoN, both of whom were forced to mothball gas fired plants that had become uneconomic to operate. Adding to the growing chorus of voices projecting a very bright future for wind and solar are Citigroup – cost parity with conventional fuels by 2020; Bloomberg New Energy Finance – providing around 70% of new power by 2030 and the IEA – renewables could be delivering more power than gas by 2016. These are not opinions that will make it any easier for the corporate decision makers in the fossil fuel industries to resolve the quandary presented by the collision between carbon and the climate. They also throw the national debate over fracking in Britain into sharp relief. There was no pressing reason for the Prime Minister to pick a high profile fight over fracking this summer. But pick it he did. Wandering in the sterile desert of Britain's energy policy, he seems to have come to see shale gas as an oasis. Get there as soon as possible and all will be well – energy bills will be lower, our economy more competitive; energy security in our own hands. Like most mirages, this one dissolves on examination. Geology and investors are not susceptible to illusions. Even with the most favourable winds, there is no prospect of shale gas making a significant contribution to Britain's gas supplies before 2020. By then, a great deal will have changed. The abundance of gas is clearly a problem for the climate. What is less obvious is that it is also an economic problem. A global market for gas is now emerging and its tie to the price of oil is loosening. The availability of cheap shale gas in the US has already led to a major scaling back of the $200 billion dollar gas investments off North West Australia. Before moving into shale gas production in Britain investors will want to be very sure there really is a profitable market for the gas. The tumbling costs of renewables is making that ever less likely. This may also explain the recent outbursts against renewables from prominent oil industry leaders seeing their growth opportunity recede. Uncertainty is the enemy of investment. Two coming events will further add to the cloud of uncertainty beginning to grow around the future value of investment in fossil fuels. Later this year the International Panel on Climate Change (IPCC) will publish its fifth assessment report. In December 2015, governments will meet in Paris to agree the next phase in the development of the international regime to manage climate change. It is already clear that the IPCC will report that its confidence in the impact of the combustion of fossil fuels on the climate has increased. It remains to be seen whether this will be enough to prompt governments to act more decisively. But it will add to a shift underway in the policy discourse over climate change. The dominant voice in the climate debate so far has been that of the fossil fuel industries and their customers. They are the climate makers. Understandably if not forgivably, they have focussed political attention on the cost to their businesses of tackling climate change. The result has been an asymmetric debate that has paid far less attention to the cost of policy failure. Politically, these costs have been thought of as far off in the future and less pressing than the cost of decarbonising the economy. This comfortable perception is now beginning to change. We are starting to hear from the climate takers. The $50 billion bill to support New York in managing the impact of Hurricane Sandy was an important moment in waking political attention to the costs of the extreme weather events. There are a very large number of businesses who are just beginning to realise that climate change will damage their interests. One hundred ski resort owners in the US wrote to President Obama in advance of his recent speech on climate change urging him to act. Businesses across all sectors of the economy from agriculture to tourism are just starting to focus on what climate change means to them. The IPCC's forthcoming report will add fuel to this growing fire. After the failure of the 2009 climate conference in Copenhagen the leaders of the climate maker companies concluded that the political will to act decisively on climate change was lacking. They were right. This led them to believe that business as usual would continue and to invest accordingly. Should Paris also fail they will continue to invest on their current $6 trillion trajectory. The collision between carbon and the climate will continue. Politicians are skilled at presenting effort as achievement, agreement as accomplishment, failure as success. Business leaders are accustomed to these devices. They will not be easily persuaded by warm words. Their own discourse is replete with targets and timetables because that is how they check on each other's performance. Unless the outcome from Paris contains legally binding targets and timetables they will again conclude that the political will to deal with climate change is absent. They will again be right.